Run the length of a marathon in seven days. 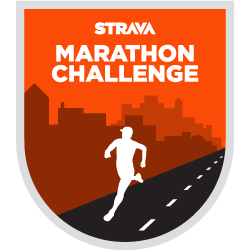 In the seven days between the London and Boston marathons, Strava is challenging you to run a total of 42.2km (26.2mi). Unlike a real world race, you can break this Challenge up over multiple activities throughout the week. Even if you can’t be at the start in Hopkinton or Greenwich Park, you can still celebrate your love for running and these iconic events by covering the marathon distance on your own between April 14th and April 20th. All activities logged during the Challenge period must be uploaded to Strava no later than April 23rd, 2014.